If you are using dried beans, this recipe needs to be started the night before. For a vegetarian version, omit the ham hock and use smoked paprika instead. Cooked beans can be kept for up to three days in the fridge. If you wish to keep them longer, divide the beans into meal size portions and freeze. The night before, place the dried beans in a large bowl. Add the yoghurt or whey, and cover the beans with at least three times the amount of water as beans. On the day of cooking, drain the beans and rinse them thoroughly. Simmer the beans in a large pot for approximately 1 hour, or until the beans are soft. Drain the beans and set aside. Whilst the beans are cooking, heat the oil in a large oven-proof pot with a lid. Add the onions to the pot, and stir to cover the onions with oil. Reduce the heat to low, cover the pot, and allow the onions to slowly cook for around 45 minutes. Stir the pot from time to time to prevent the onions catching on the bottom. When ready the onions should be soft and golden in colour. Pre-heat the oven to 170C (150C fan forced). Add the mustard, molasses, sugar, Worcestershire sauce and cloves to the onions, and stir to combine. If making the vegetarian version, add the smoked paprika at this stage. Stir in the tomato passata and water, season with salt and pepper, and mix thoroughly. Gently stir in the cooked beans. If using the ham hock, add this to the pot and gently push the hock to the bottom of the pot so that it is covered by liquid. Taste and adjust the seasonings if required. * If making the vegetarian version, the beans may be ready sooner. Vegetarian beans are ready when the sauce has thickened nicely. 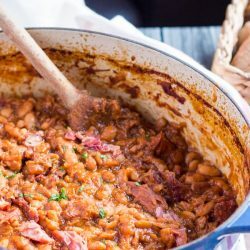 The meat version of these beans are ready when the meat can easily be pulled from the ham hock. Check the beans occasionally during the cooking time, and if they seem dry, add some more water to continue the cooking process. The Shortcut Version: If you don't wish to cook the beans, use 3 x 400g tins of drained and rinsed cannellini beans in place of the dried beans. The onions can be cooked as detailed above, or can be replaced with 1/2 cup caramelised onions. Warm the onions in the pot, then continue as detailed in the recipe above.